Part 1, “Overview” on page 1, introduces the BPM products that we discuss and provides an overview of basic topology terminology. 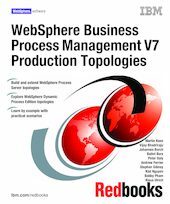 This part also provides an overview of the production topologies that we describe in this book, including a selection criteria for when to select each topology. Part 2, “Building production topologies” on page 53, provides a series of step-by-step instructions for creating production topology environments using deployment environment patterns. We describe topologies using the Integrated Solutions Console and a command-line interface.